Does cold and rainy weather cause back pain? Often my patients tell me that they feel more aches and pains as the weather turns cooler and I am regularly asked if pain is linked to a drop in temperature. With the cooler weather approaching and some much needed rain in northern NSW, you may find that you get a few more aches and pains. This is because when the body is faced with low temperatures, blood vessels narrow in your extremities and divert that extra blood to vital areas like the brain, heart and lungs to keep them warm. When muscles, tendons and ligaments have less blood, they become stiff. It’s the same with the structures supporting your spine. When the weather is cold, there is less blood flow to the structures supporting your spine and they become naturally stiff which, in turn, places extra strain on the back. Additionally, if joints are already inflamed, a drop in barometric pressure or temperature can cause swelling and subsequent pain. It’s important to note that the majority of spine pain is caused, not by a problem with the spine itself, but by strain or injury to the muscles, tendons and ligaments that give it support. If these tissues are stiff and pull on the sensitive nerve endings in the spine—which is common—it can feel like your back is hurting despite the fact that the source of the pain is not the spinal structure. On top of this, tight or cold muscles, tendons or ligaments are much more susceptible to strain or injury. Metal implants can further exacerbate the condition because metal implants react differently to human tissue. If they get cold, they can start lowering the temperature of the tissue and nerves surrounding them, which can lead to back pain. People whose device is simply covered by skin or a thin layer of soft tissue are much more likely to experience aches and pains in cold weather. Just as importantly, research has shown that cold weather and dark days can contribute to what is known as seasonal depression, which can cause or aggravate back pain. Seasonal affective disorder, also known as SAD, is a type of depression that typically occurs yearly, starting in autumn and lasting through the winter months. There are a number of factors that can cause seasonal depression such as the decreased amount of sunshine throwing off your body’s circadian rhythm and causing a drop in serotonin levels in the brain. Seasonal depression can also cause fatigue, increased perception of pain and decreased interest in daily activities that can prevent people from exercising and strengthening the muscles supporting the spine, which in turn causes back pain. The key to reducing back pain in cool and rainy weather is to make every effort to keep yourself warm and ensure that you do daily low-impact exercise such as walking, swimming, bike riding, yoga or indoor aerobic exercise. Our muscles need continued exercise to remain strong and if you are neglecting to work out when it’s chilly, you are opening yourself up to injury further down the line. Regular exercise is also a great way of releasing endorphins, those natural mood lifting hormones that help reduce depressive symptoms. Overall, it’s important to know that daily back or neck pain is not normal. 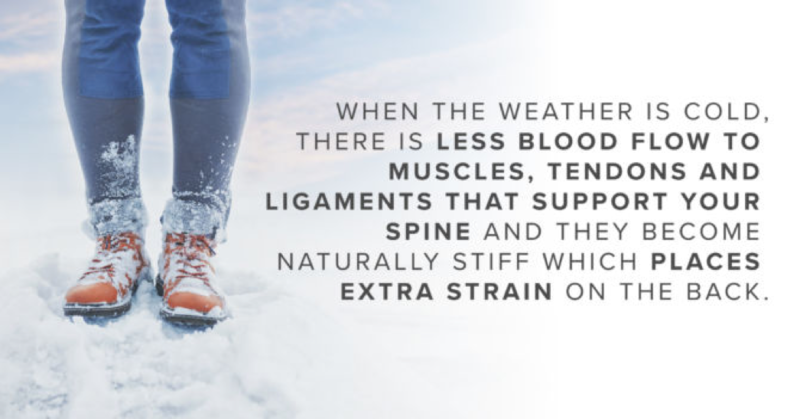 If this is something you’re experiencing or if you need advice about a winter exercise program to suit your needs, contact me, Bruce Lane at Lane Chiropractic on 6676 2270.